This is a classical “Russian” stew, called in Russian “Jarkoie” – quite simple to make and very tasty when served hot (fresh from the pot). 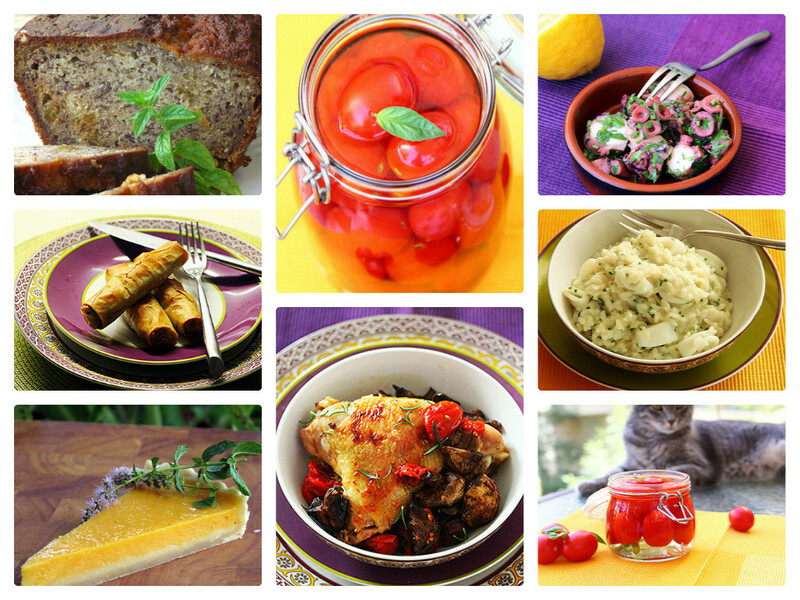 * In my case, I have used the prepared chopped dried dates (they were sold in a pressed brick form in a vacuumed package, usually for making desserts). I’ve cut a small brick of approximately 2*8 centimeters. Instead you could use 10-15 dried dates, just peel them, remove the stone and either grind them in the blender with the brandy into a homogeneous mass, or just cut them into small pieces. Cut the onion into small cubes. Cut the meat into larger cubes (approximately 2 cms). Peel the garlic clove, press them with the knife and then cut into small pieces. Warm the oil in a heavy pot. Fry the onions until transparent. Gradually add the meat and fry the cubes on all sides. Add the garlic and fry until a typical fried garlic smell appears.Then add the dates and the brandy and bring to boiling. Add salt and pepper, put rosemary and simmer under closed lid on low heat for 2 hours (until the meat is tender). In our case, the dish was served with fried potato wedges. 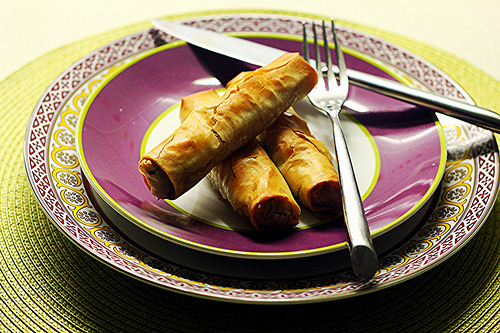 This is a very famous oriental (middle-eastern, I guess) dish made with Phyllo dough. The original ones are usually deep-fried in oil and, therefore, become very fatty. In my version, I sprinkled the cigars with oil and then baked them. The result is very crispy and much less fatty. The only downside 🙂 is the fact that rolling them is still a lot of work. 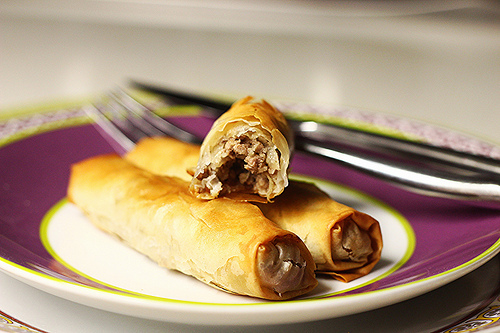 If your Phyllo dough is frozen (it is sold that way) – put in the fridge beforehand. Onion should be cut into small cubes. In a heavy saucepan, heat the oil and fry the onions until they become transparent. 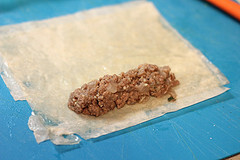 Add beef and cook over high heat, stirring and breaking up the pieces of meat with a fork into gravel-like form. 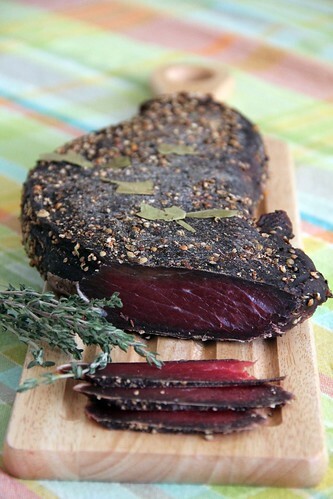 When all the beef completely change color – add spices, salt, pepper; mix everything again and remove from heat. Cool to the mixture to room temperature. Cut the Phyllo dough into quarters. It’s best to cut all the sheets at once (first cut into two rectangular halves, fold and stack these rectangles, then cut in half again into two squares). Beware, the dough is drying very fast, so while you wait for “rolling” the cut pieces of dough should be stacked and covered. Take one piece (quarter) of dough, and brush some oil on it. Do it lightly, being careful not to put too much oil and not to tear the “page” of dough. 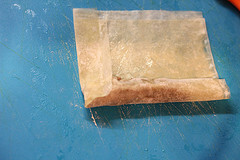 Then cover it with another square piece and brush it with oil as well. 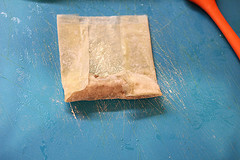 Spread approximately 1/2 tablespoon of the meat mixture near one and and start rolling the cigar in the sequence shown below – first cover the part with the stuffing, then fold the sizes and roll into a tube. 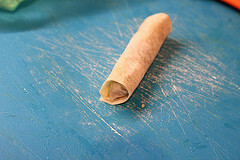 Resulting rolls should be laid on a baking for covered with baking paper laid baking paper. Sprinkle some oil, preferably for a pressurized container (I used olive oil) and then bake in pre-heated oven for 30 minutes at 200C, until the exterior of the cigars turns golden brown. Serve hot – when they cool, the dough gathers moisture and looses the desired texture.